From Sock Innovation, the Rick Socks are a wonderful knit! I’d knit them again in a heartbeat. 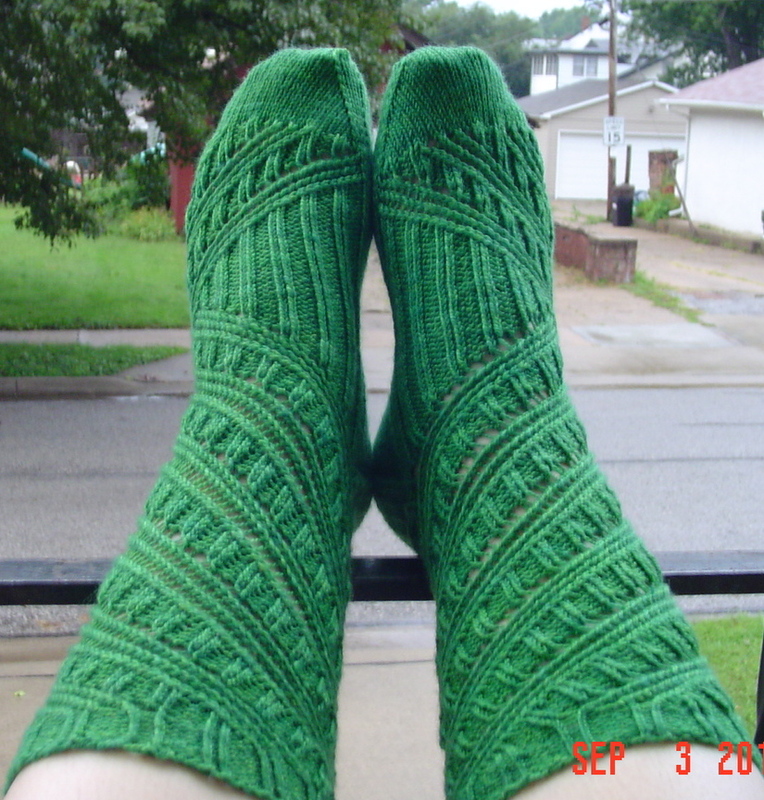 The yarn is Sundara Sock, color grass over lime. This is the first time I’ve used this fabled yarn, purchased in a destash. It is nice, I love the semi solids, and it has a nice hand. I actually finished these last weekend but didn’t get around to taking a picture until this morning. I guess you could say I’ve been a bit busy? The good news? During the 3rd try of the attitude sweater, I think I have a sleeve that fits. The problem is, the recipient is small, but she likes largish sweaters. The size I am making causes the arms to be far too large, so I’ve had to compensate by using a smaller arm pattern. I’ll have to make that up once I attach the arms to the body. I actually knit last evening! Yesterday I thought motherhood was the pits. Today I feel mildly triumphant. Let me tell you about yesterday. Yesterday I went to put Bug’s hair in two ponytails as per usual. I said “Bug, we really need to get your hair washed tonight, your hair is very dirty.” And then I noticed that the dirt was moving. Ayup. We know what that means. I was so horrified, I never had it as a kid. So I called in to work, said I’d be in late, didn’t know what time. Ran out and got shampoo and a comb. Spent the next 5 hours on Bug’s hair. In the end I gave it two treatments and a vinegar treatment. I went through it strand by strand 3 separate times. I was NOT going to let anything get away. I resorted to isolating and cutting individual strands of hair. I intended to cancel all plans for the weekend and just worry over her hair. Last night her sitter, who was made aware of the situation, said she went to bed with the back of her neck itching. I thought for sure I’d wake her up this morning and find more. I got her up super early, checked strand by strand again, and nothing. Nothing to be seen. The itchy spot on her neck? A mosquito bite. I’ll be checking strand by strand daily, I’ll try olive oil and cetaphil next if we have a problem, and I’ll leave the hot water heater on high for the time being, but it looks like my meticulous OCD kicked in and I got them all for now. Now for the story of the poor communication at school. I called in early, explained what was going on, told them that Bug would be in late, and that they need to have the nurse check her class. After all, she doesn’t hang out with many kids, and she had to get it from somewhere! The school said they would do that. A little while later I get a call from the school. “Bug doesn’t seem to be in school today.” “Yes” I explained, “I called in earlier, I am in the middle of treating her for lice, she will be in when I am done. If you didn’t get that message, please double check that her class has been checked for lice by the nurse, I do not want her to go back into an infested classroom.” “Oh, I wouldn’t know anything about that” she said, “So you are saying that Bug has a doctor’s appointment this morning and will be in later?” “Um, NO, that is not what I said.” So I explain myself again, then give up because it is just too hard to deal with stupidity when you haven’t had coffee or breakfast and have spent the last 2 hours working on your daughter’s hair. So after I complete my epic project, I take her in to school. I say “Bug is here and ready to go back to her classroom, has the class been checked for lice.” She says “Oh, I wouldn’t know anything about that.” I say “Look, I do not want to send her back into an infested classroom, so who can I speak to about that?” She tells me to talk to the nurse. Meanwhile, the assistant principal comes over and says that she is sorry that she didn’t communicate Bug’s absence, but that they have been checked. I insist on talking to the nurse anyhow. I ask the nurse “Has the class been checked?” She tells me yes. I just stand there. Nurse says “there were indeed other children with lice.” I say “please tell me what is your procedure for this.” She looks at me funny. I say “Look, I am not asking who patient X is, I couldn’t care less. I am asking have those children been sent home? I spent 5 hours on my daughter’s hair, I am asking you to tell me if she is likely to be infested again today?” Nurse says “We can’t send children home for that. But their parents have been notified.” So basically, in order for her to be in school I have to chance lice. Great. Because I am feeling positive that this will be an ongoing problem in this classroom, I purchased a very highly recommended metal comb for us to use. The plastic one really didn’t do a thing for us, I spent all my time using it to look through hair, and then removing anything I found by hand. Thankfully, Bug, who never stops moving, was entertained by movies and snacks and really did a great job sitting still for 5 hours. If you know my child, you know what a small miracle this actually is. I notified the neighbors, because she spends so much time with them. They thanked me for doing so. Since those children go to another school, I didn’t want us to be causing an infestation of a different school, plus I didn’t want to have anywhere which she could pick it up again if at all possible. While I am mortified, embarrassed, disgusted, etc, they seemed to view it as part of childhood and didn’t seem overly upset. What an experience. One which we will be revisiting carefully for the next few weeks!